Prints and actual cells from all 7 Harry Potter movies! 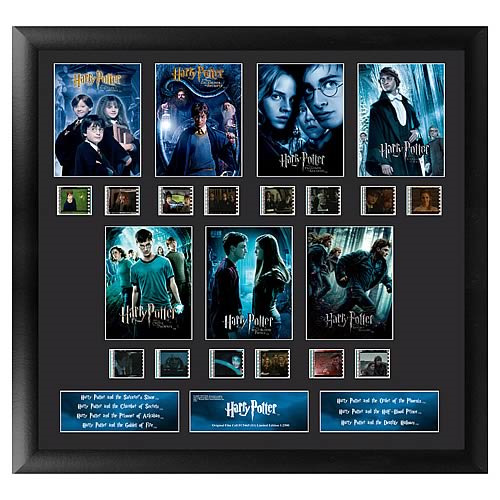 This stunning film cell features prints and actual cells from Harry Potter and the Sorcerer's Stone, Harry Potter and the Chamber of Secrets, Harry Potter and the Prisoner of Azkaban, Harry Potter and the Goblet of Fire, Harry Potter and the Order of the Phoenix, Harry Potter and the Half-Blood Prince and Harry Potter and the Deathly Hallows. It measures 19-inches tall x 20-inches wide, with all elements beautifully framed in black wood. A certificate of authenticity is included. It will make a striking addition to your wall. Please note that the actual cells of film may vary from piece to piece, as they are hand-selected from reels of film. Order yours today!